Customize this pillowcase for your loved one so they never have to sleep alone! 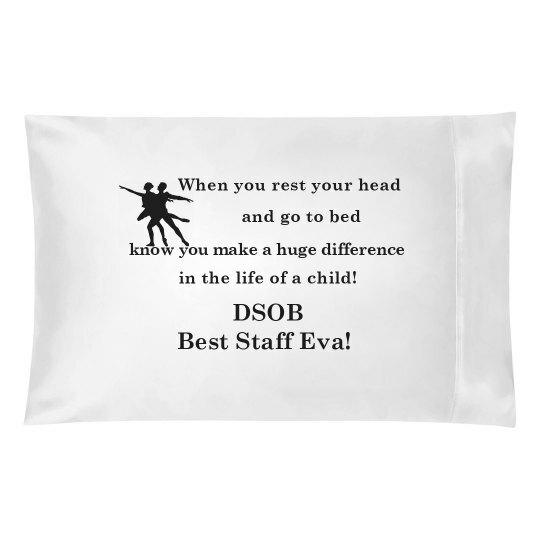 Made from a polyester/cotton blend, this customizable pillowcase is both comfortable and durable. So what is "precale"? An item with a percale weave has a thread count of about 200 or higher, and is noticeably tighter than the standard type of weave used for bedsheets. It has a medium weight, is very firm and smooth with no gloss and washes very well. Earn 20.00% when you sell this item. Custom Text: When you rest your head | and go to bed | know you make a huge difference | in the life of a child! | DSOB | Best Staff Eva!